with the marksmanship of knowing. indulge myself upon this, my field of words. This entry was posted in Poetry and tagged Author, Blogging, Creativity, Dreams, Inspiration, Life, Nature, Poem, Poems, Poet, Words, Write, Writer, Writing. Bookmark the permalink. I can only ditto what has already been said in the many comments that came before mine. I would love to write such lovely poetry!!! So sweet. Well, I for one am enjoying your work. =) Thanks, R.
Nature is just so inundated with imagination. Nice poem. I just love this ode to wildflowers. Much of my inspiration comes from such a place as well. First of all I know not why you have chosen to centre justify, it may look pretty but it also makes the readers task just a little bit more difficult. Although many will say that this is nonsense and that it can be understood perfectly well, but there will be slight hesitations here and there in the readers mind which can interrupt the flow, especially when reading it out loud, which is the only way a poem should be read. Unless you are saying it is ‘concrete poetry’, although I see no evidence to suggest that this is the case. Also I would add to this that the lack of capitalisation for the beginning of sentences can also hinder the reader in their reading. It is your poem so therefore it is easy for you to read through without the slightest of hesitations anywhere, but for the reader who comes and sees it for the first time the task should be made as simple as possible. 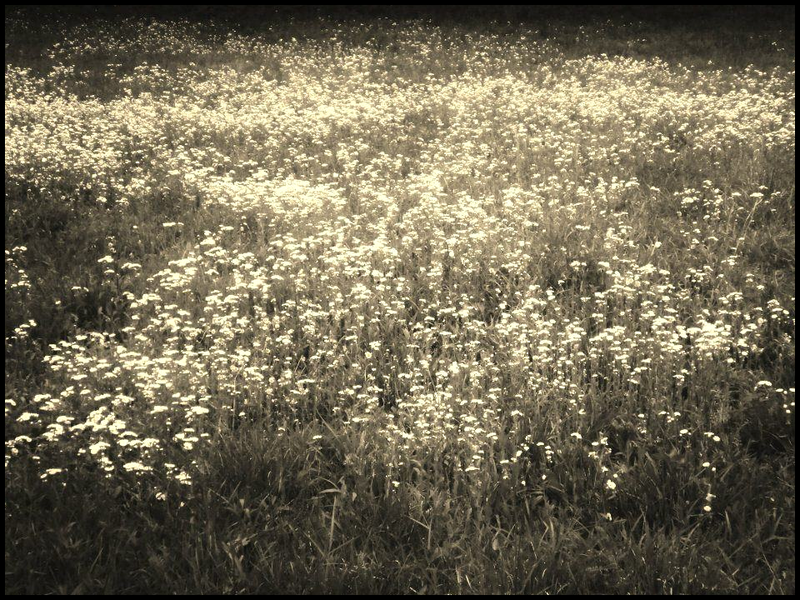 this epicurean sea of wildflowers and opus—– Although not technically incorrect ‘this’ suggests either that there are several fields or that it is a field we have been previously introduced to. ‘An epicurean sea’ would work and also has the added bonus of the sonics of ‘an’, (I’ve forgotten the word, it’s like alliteration but slightly different). ‘Epicurean’ is an good choice of word and sets us up for the sensual journey ahead. white blossoms stirs beneath the rising day—- End of sentence, new sentence next line??? winds drive pollen grains and promise past—- Good alliteration again with the p’s. My mind keeps on wanting to read it as ‘pollen grains of promise’ it would seem to create a stronger single image than a seperate image and idea. I find the concept of driving ‘pollen grains of promise’ easier to grasp than the concept of just driving ‘promise’. the velvet parting into stigma and style—- Again good choice of words with ‘velvet parting’, you really are managing to finely balance the whole poem on the edge of sensuality without it tipping over into sexuality, although it is indeed sexual in the fact that is about reproduction even though it is a metaphor, but many people would have fell into the temptation of taking a step too far with the imagery. with the marksmanship of knowing.—- I’m really struggling with this line and believe me I’ve read it every single possible way. I know what you are implying and I get the fact that there is a gender identity there which compliments the ‘she’ who ‘spills seminal secrets’, but I can’t get away from the fact that for me the word ‘marksmanship’ ultimately leads to the image of a gun, which in turn becomes a violent image. If you are a good ‘marksman’ you are good at hitting the target, yes it works in that sense, but it comes from good at hitting the target with a bullet, hmm it can still be working, but then from a gun, hmm at a stretch I can see it but I can’t get away from a violence which is the opposite of the moment of creation that you are relating it to. I even went down the path of thinking that it may be a cultural misunderstanding and that it could be used in a different sense by Americans in which it would not relate to guns, but I never found any evidence to support this. Also I suppose I’m really struggling with because I am at a loss as regards a possible alternative. this field, voluminous womb, awash with prose—- ‘this field’ – which field, ah the field that you have introduced us to already, I know which field you mean… ‘this’ works perfectly well here. Very good sonics in ‘voluminous womb’ they make it sound even larger and again they sound sensual. drinks the sun that climaxes overhead. a rain—- Good line and once again a perfect choice of word in ‘climaxes’, still balancing the sensuality well. I’m tempted to say that ‘overhead’ is redundant because to say ‘climaxes’ implies reaching a peak which in the case of the sun is at midday or meridian which because it is at its peak is naturally going to be ‘overhead’. If the sun is ‘a rain of white sapphire…’ then it would read better with a comma after ‘overhead’ instead of a full stop and also put ‘a rain’ onto the next line. indemnifies last night’s shower,—- I like ‘indemnifies’ but then the ‘shower’ becomes slightly mixed up in my mind when the sun was just described as a ‘rain of…’, they seem to be at odds with eachother, unless I’m misreading it and the ‘rain of white sapphire’ is something else. and the dandelion memories too much—- If the previous stanza is to be one whole sentence then this line here would be a new sentence and you could start it at ‘Dandelion’ and it would still work well. for me in the wind perish in a panoply of filaments—- Thank you for ‘panoply’ it is beautiful and new to me, also when I looked it up I cursed myself for not taking the time to look at it and work it out logically using its etymological construction. with poetry, the story under stories of the grass,—- My poetry brain instantly wants to point out repitition of ‘story’ ‘stories’ here. I can’t quite decide if it is working, (it’s 6 o’clock in the morning), could one of them be replaced with ‘legend’ or something similar??? translating the anatomy of nature’s mystery and—- Possibly shift and to the next line to avoid any awkward enjambment. indulge myself upon this, my field of words.—- is ‘this’ needed here?? We know the field in an almost intimate way, ‘this’ seems a little bit impersonal. “I will take ‘this’, my middle child to school”?? Also, I hesitate to say this but for the final phrase to also be the title of your poem can seem a little bit cliche and in much the same way that I would urge people not to have the title the same as the first line, I would also say the same for the last line. Diana, I really do think that this is an excellent poem, the best of yours that I have read and I’m so glad that I went through it the way that I did because I feel as though I got to know it a whole lot better than if I were to have just read it through a couple of times. There are a couple of word choices that are nothing short of superb and I really can appreciate the thought that you put into choosing those particular words. Usually at this point after critiquing a poem people will say something like “just my honest opinion” as a kind of apology that justifies the critique. You know that it is my honest opinion, what else would it be. So instead I thank you for writing it which in turn let me look at closely and critique it which in turn has made me a slightly better poet. I wish that others in blog world felt free enough to be able to critique peoples work, for me that would be truly wonderful. Hope all is well with you and your family, thank you once again, take care. So now it’s my turn to tax my brain at 6 am. You know I’m grinning. Hey, who in the world wouldn’t feel honored by such amazing, thoughtful reading? You and I really do share a particular palate for poetry and hold it to its best. This is one of the few poems I have center-justified. It looked the best that way (was a voila moment when I finally figured it out after wrangling with the left flush) and I think doesn’t hurt the reading but I will keep your dissent in mind, buddy. “It may look pretty but”. I am so not visual. It is with effort I remember that looks matter (whether it be words or my own appearance). The opening THIS was important and therefore intentional. Completely changes things without it. I had to keep the gender a bit ambivalent (had played with that) and THIS was a deeply personal poem (pregnant with poetry, very much about my own body and my lying on that (or really, this) field in fecundity. I don’t gloss over punctuation. Sentence markers are important to me. I didn’t want the poem stopping too much (in regard to your suggestion for that first stanza). And THAT is the beauty (of the flexibility) of poetry, the one medium where a fresh line says it all, can serve as a new sentence or near-synonym of one (not always. can). I see a few places where, funnily, you are reading this like prose. Like what you’re hearing with the grains of promise (which would be a poetic way to roll out prose). I mixed the concrete with the abstract purposely (drive..grains and promise). You’re right. We don’t usually drive promise. But it’s the wind. It drives everything and this is a poem. Having said this, I understand and value how you processed that line. I actually like it better without the article before the bees, M. But I’m hearing it before THE winds, and it would be awkward to use only one THE in that line. I may knock off the THE after some thought. I love the distinction you noted (sensual vs. sexual). YES, altogether sensual, but I didn’t want to be cheap. Too much of that out here. “Also I suppose I’m really struggling with because I am at a loss as regards a possible alternative.” Here you go: so you are the only one I have explained this to. I originally had “marksmanship of knowing” in mind for a post on art. The artistic process. I’ve had an amazing article I found gathering dust in my growing drafts pile about how the Japanese have copied nifty things American and made them better (and more American). Talked about the J’s penchant for perfection. Made me think about my work and what came to mind is how craftsmanship at its best is the marksmanship of knowing. Whether it’s in that search for the best word we’ve talked about or lining that stitch in the leather JUST so. So we disarm the metaphor of bullets, as you can see. =) I was enabled to convey the sensual aspect along with the creative aspect (where I become pregnant with poetry, privvy to the marksmanship). “I cursed myself for not taking the time to look at it and work it out logically using its etymological construction.” LOL!! Please don’t curse yourself. You deserve a medal for what you’ve done with this poem in your conscientious reading. You know I work HARD not to repeat words (pull out that thesaurus!). Story…that was intentional. Again, you’re thinking prose. We get rhythm with the repeat, the aural layering of stories (synonym for floor, in fact) from which we get subtext. “I wish that others in blog world felt free enough to be able to critique peoples work, for me that would be truly wonderful.” You SAID it!! And talk about support. I have valued your time and careful reading these two years, Mark (AHJ turned 2 this month). Just as you don’t sign off with the cliche justifier, I also will thank you simply and deeply for the critique – and will most likely run through it again before publishing my next poem. You are the writing circle that time does not permit me to join. Sad you are not actively blogging anymore but I know that was the right thing for you in your judgmt and am glad you’re still reachable by email. Stay amazing. Thank you so much for your thoughtful response. When I first thought about offering a critique for your poem I didn’t have the slightest bit of doubt or hesitation because I knew for certain that you would not be offended by it. Thank you for taking the time to go through my comment and answer each point individually, I know how precious time is for you. I also thank you for bringing to my attention the fact that I “read a poem with the eye of a poet and a mind set on prose”. It is very interesting that you have noticed this and kind of confirms to me that I do lean towards a love of poetic prose more so than just poetry, I will bear this in mind for the future. My brain’s now working in full gear 8 hrs past 6 am. Just walked in. The biggest reason I decided to go w/ the center flush was it had shaped the poem like a womb. Ah!! Now I see it. Although I did say “Unless you are saying it is ‘concrete poetry’, although I see no evidence to suggest that this is the case.” And you were saying that it was ‘concrete poetry’ ie poetry in which the visual form of the poem is used to convey meaning, it’s just that I didn’t look hard enough. Centre justification is justified. Haha but you have to know them to break them! 🙂 Nice work. That’s my sort of field 🙂 Epicurean sea – that’s the word. Glorious Earth! I enjoyed the critique and your rebuttal as much as the poem. The public is not usually privy to the creative process, just the final artwork presented. Reading through that incisive exchange gave me more than just a peek into the writer’s mind. Mark’s wasn’t incisive feedback and my response wasn’t a rebuttal. =) He’s cool, has been with me these two years, and I am grateful for the thoughtful, conscientious read. Who wouldn’t want someone poring over his, her words? I welcome input of all colors. I wish there were more honest exchange and criticism on WPress. Most bloggers have been appreciative when I would point out a blip or two. One reader unfollowed when, after heaping praise on the rest of her work, I made a suggestion for improvement. I would not take the time if I didn’t care for the creative process and care to raise the bar for all of us. To use a baseball colloquialism: ‘You’ve knocked this one right out of the park.’ Absolutely stunning, D.! *Smile* Who wouldn’t want to hear this? Thanks, K.
Thank you. And I appreciate the follow. =) Welcome.